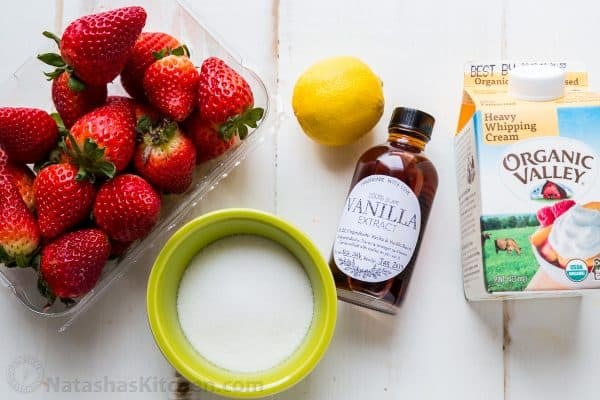 These mini strawberry cheesecakes are easy to make (the simple ingredients will surprise you!) and they disappear fast. Everyone of all ages loves these. They are so cute being mini cheesecakes; just asking to be picked up and put on your plate. Don’t let the cuteness fool you. The texture of these is phenomenal! The cheesecake is creamy and smooth with a buttery crust and the fresh strawberry topping cuts the sweetness and makes every bite irresistible. 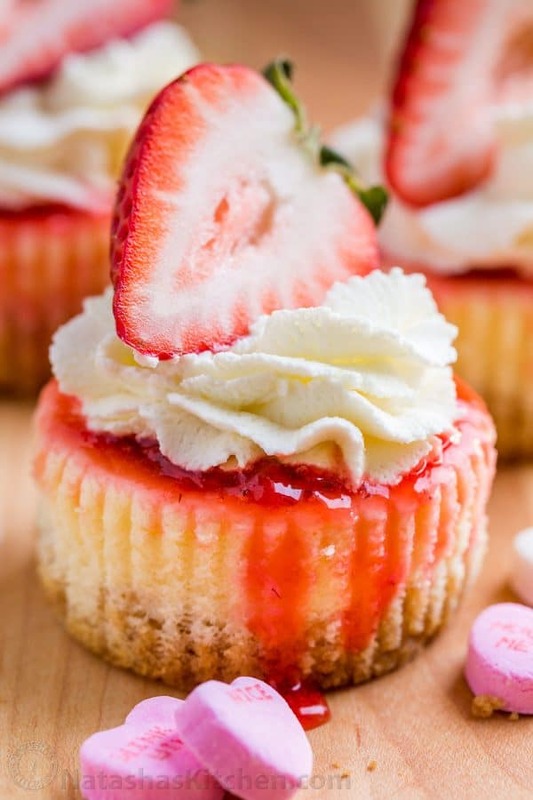 Mini Strawberry Cheesecakes are perfect for entertaining. 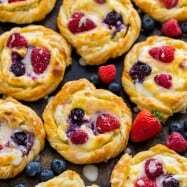 You can make every part a day ahead; the cheesecakes and toppings, then assembled quickly before serving making them ideal for your next gathering. 1. Preheat Oven to 350˚F. 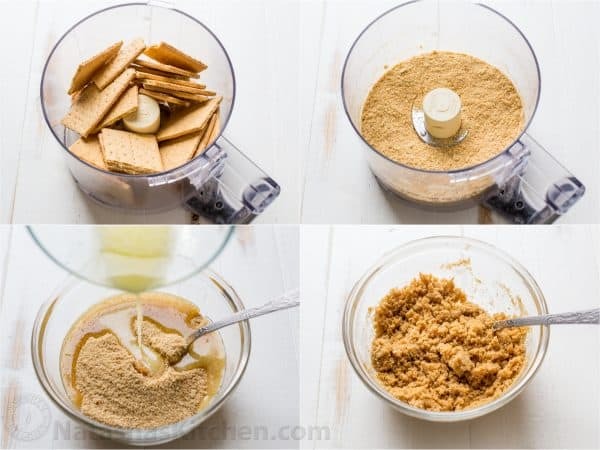 Pulse graham crackers into fine crumbs using a food processor, high powered blender, or place in a large ziploc bag and crush with a rolling pin. In a small bowl, combine 1 1/2 cups graham cracker crumbs with 6 Tbsp butter and stir together to moisten crumbs. 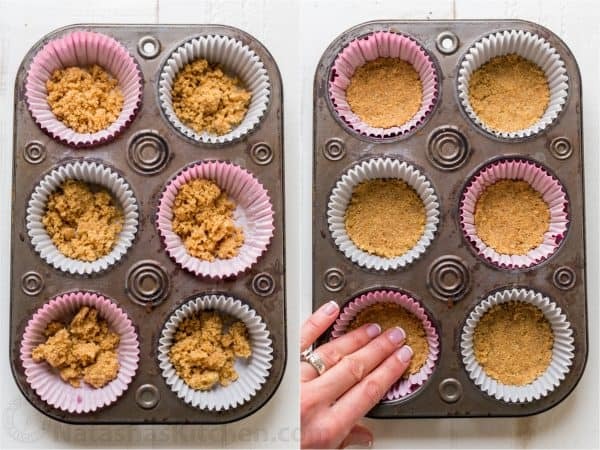 Line 24 count standard-sized cupcake or muffin tins with paper liners and divide crumbs between 24 liners (about 1 Tbsp in each). Press the crumbs into the base with fingers or a small spoon. 2. 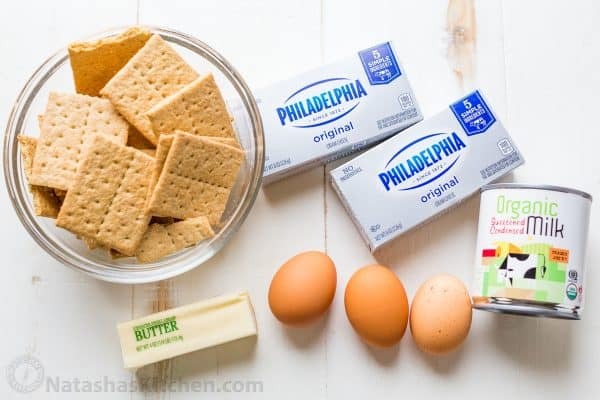 To make the filling: In the bowl of your stand mixer fitted with whisk attachment, add 16 oz softened cream cheese and 3 eggs. Beat on high speed 5 minutes or until smooth, scraping down the bowl a couple of times. Add condensed milk and mix on low speed until blended (2 minutes), scraping down the bowl as needed. 3. Divide filling evenly between cupcake liners, filling each about 3/4 full (For easy portioning, use a leveled ice cream scoop). Bake in preheated oven at 350˚F for 13-15 mins. They should be set with a very slight jiggle in the center. Slight cracking is normal but if you notice deep cracking they are over-baking. Remove from oven and let them cool to room temperature in the pans then refrigerate until chilled. 4. To serve: top with chilled strawberry sauce (recipe here). 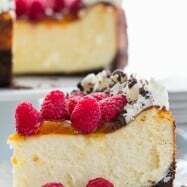 Make whipped cream by beating together 1 cup heavy cream with 1/2 tsp vanilla and 1 Tbsp sugar for about 2 mins on high speed or until thick and fluffy then pipe swirls using a large open star tip over the center of each cheesecake. Place a halved strawberry over each swirl of cream. P.S. Speaking of mini cheesecakes, don’t miss our salted caramel mini cheesecakes here. Also, here is another mini dessert that is surprisingly easy and perfect for parties! 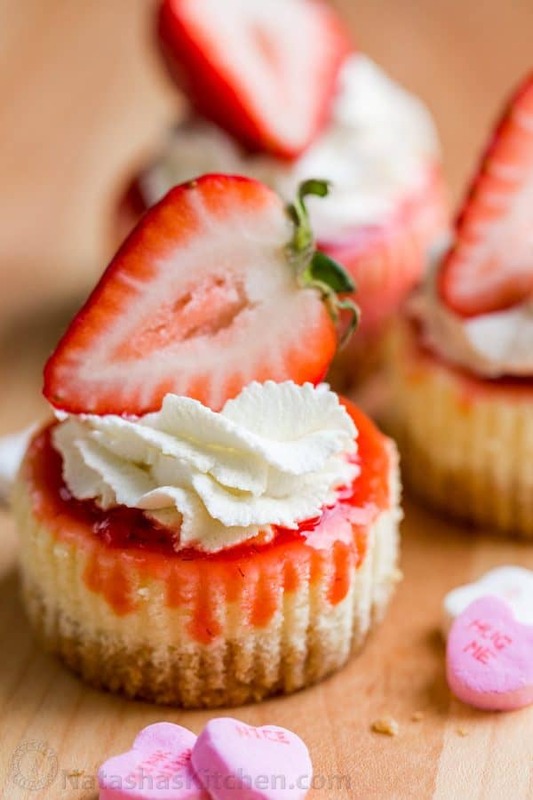 These mini strawberry cheesecakes are easy to make (the simple ingredients will surprise you!) and they disappear fast. The texture of these is phenomenal! 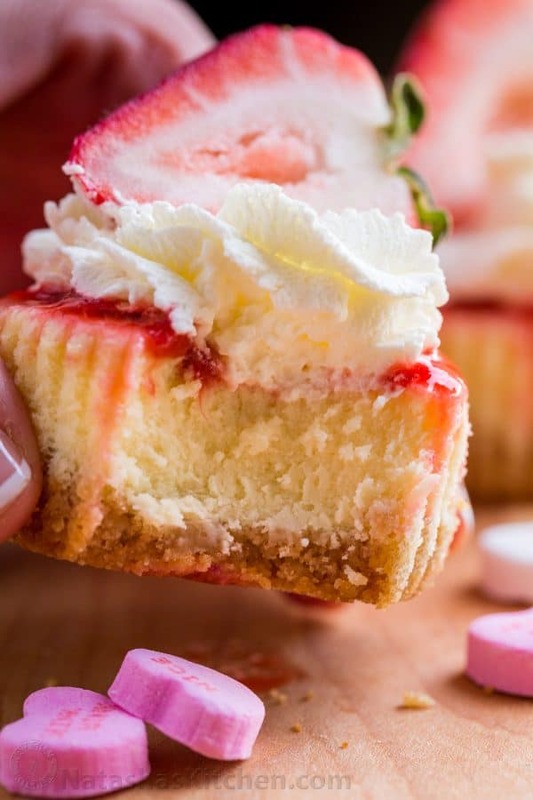 The cheesecake is creamy and smooth with a buttery crust and the fresh strawberry topping cuts the sweetness and makes every bite irresistible. ! Preheat Oven to 350˚F. In a small bowl, combine 1 1/2 cups graham cracker crumbs with 6 Tbsp butter and stir together to moisten crumbs. Line standard sized 24-count muffin tins with paper liners and divide crumbs between 24 liners (about 1 Tbsp each). Press crumbs into base with fingers or a small spoon. 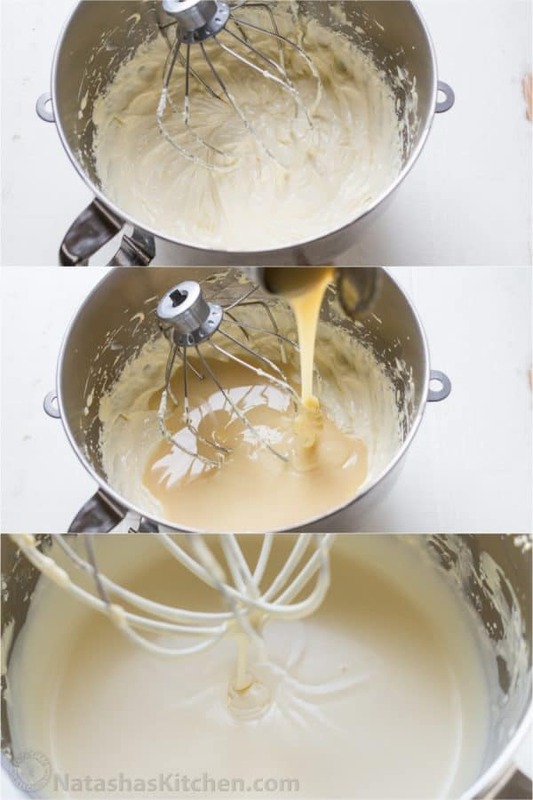 To make the filling: In the bowl of a stand mixer fitted with whisk, add 16 oz softened cream cheese and 3 eggs. Beat on high speed 5 min or until smooth, scraping down the bowl a couple of times. Add condensed milk and mix on low speed until blended (2 min), scraping down the bowl as needed. Divide filling evenly between cupcake liners, filling each about 3/4 full (For easy portioning, use a leveled ice cream scoop). Bake in preheated oven at 350˚F for 13-15 mins or until set with a very slight jiggle in the center. Slight cracking is normal but if deep cracking occurs, they are over-baking. Remove from oven and let cool to room temperature in pans then refrigerate until chilled. 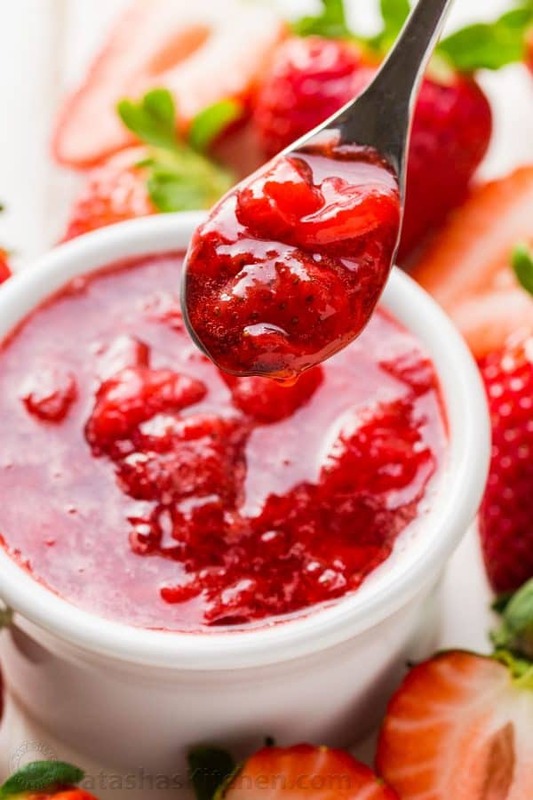 Top with chilled strawberry sauce (recipe here). 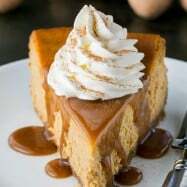 Make whipped cream by beating together 1 cup heavy cream with 1/2 tsp vanilla and 1 Tbsp sugar for about 2 mins on high speed or until fluffy then pipe swirls using a large open star tip over the center of each cheesecake. Place a halved strawberry over whipped cream. Visit Natashaskitchen.com for strawberry sauce recipe used as topping in this recipe. These are minis but taste like a fancy slice of New York Cheesecake – a memorable treat that is perfect for Valentines Day, bridal and baby showers and for satisfying the fiercest cheesecakes cravings. I’d pass you one if I could. Hope you have a sweet Valentine’s Day! Need more V-Day inspiration? Check out our favorite Valentine’s Day Recipes Here. 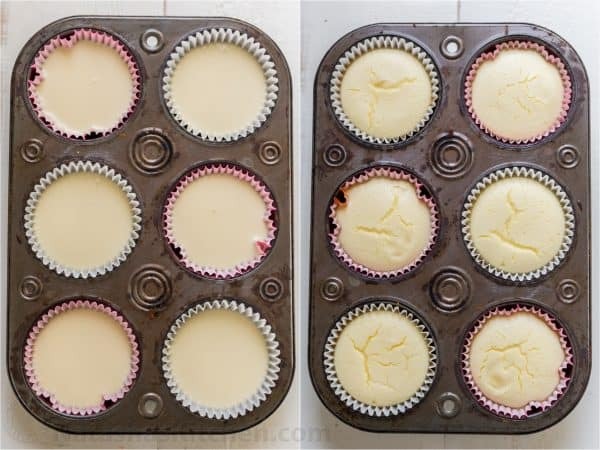 Can I use this sme recipe for a large mould (8-9″ diameter) instead of mini cupcakes? Will it affect the texture? I don’t have a food processor so would it be okay to use graham cracker crumbs? 1. How many days after preparation can I store the cake in the refridgerator? (Cling wrapped) having the texture preserved. 2. I didn’t specifically find Graham crackers in UAE. Any substitue/ brand that you would suggest? I made mine with cream crackers ad the base turned out to be a bit powdery. What size was the pan? Natasha, these were AMAZING!!! 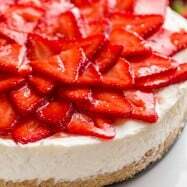 It was my first time make cheese cake and my son and husband LOVED them! 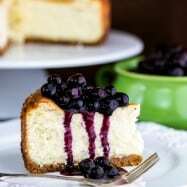 I plan to make the blueberry cheesecake for Thanksgiving! This recipe is great I made it for a tea party and was a great success. The only change I made was, instead of strawberries, I added bluberries and decorated with a mint leaf. 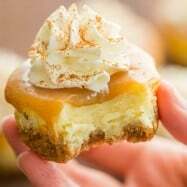 Has anyone used this cream cheese filling for a normal sized cheesecake or would I be better off using the recipe for the blueberry cheesecake? Curious. Very delicious, made these today and half of them are already gone. My husband, who doesn’t like anything “cheese” lol said these cheesecakes are yum! Do you use mini muffin liners or regular size liners?? You mention 24 mini, but the pics look like regular size? ?